There was a flurry of news recently about the US and NZ building “better relations” as Leon Panetta, the US secretary of Defence, visited the country. There hasn’t been such a visit since NZ was suspended from the ANZUS military agreement because of the ban on nuclear warships docking in NZ ports. 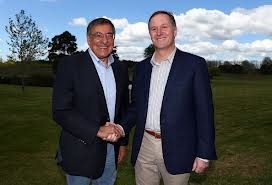 Panetta wants to station US troops in NZ. Whenever there is discussion about ‘better military relations’ we must wonder who will these relations be better for? Will closer military relations benefit working people or will it benefit the wealthy? The New Zealand capitalists want closer relations with the USA for, as I see it, two main reasons. First there is the access to trade deals and other economic benefits from the plunder of the Middle East and other imperial exploits. 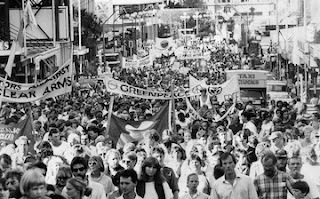 For resources such as cheap labour and raw materials and access to markets to sell goods there is a section of the NZ elite that supported the invasion and occupation of Afghanistan and Iraq. Can anyone remember Don Brash or John Key talking about how ‘we’ should have joined the invasion of Iraq to get better ‘trade deals’. These so called ‘Free Trade’ deals, like the Trans Pacific Partnership Agreement will mean the continued race to the bottom in terms of wages and conditions for workers in all countries. The second reason capitalists in New Zealand support a return to ANZUS is that it would tighten up the already strong economic and political alliance in the pacific that is in competition with China. Ever since the end of World War Two the USA and its allies like Australia and New Zealand have dominated the Pacific. This is more than simply economic exploitation to Military interventions. Troops and police have been sent to Tonga in 2006 and the Solomons in 2003 under Helen Clark’s Labour government to prop up corrupt governments that protect the profits of NZ, Aus, and US corporations. China is a growing threat to this political bloc in the Pacific. While it is one of NZ’s, the USA, and Australia’s biggest trading partners there is a political tension growing between the US led countries and China. In the pacific the most glaring case of political tension is over Fiji. However in many places, including NZ, there is competition between Chinese investment and aid and western investment and aid – where both groups are trying to buy influence. It is unlikely that any open conflict in the Pacific will erupt any time soon especially since the US and NATO forces are still continuing the predatory occupation of Afghanistan. Even this being the case it would be a big step backwards for working people, in China, the USA, and NZ for NZ to re – enter ANZUS. Nuclear armed and powered warships (or warships of any kind) can only benefit the capitalists by providing them strategic advantage over their competitors in other countries. Working people, students, and the oppressed should reject any appeals that say we need ‘defence’. It was ordinary people that put the pressure on the government and business community to ban all nuclear powered or armed warships. Above all it was the wharfies on the ports in NZ that forced the government’s hand. There was a campaign of strike action that escalated to the point where the workers would shut down the ports whenever a US warship docked. This is the kind of power that can defend ordinary people from the horrors of war abroad and poverty at home. 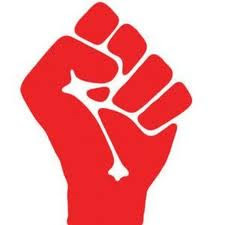 We should look to building a stronger workers movement that has international links with the workers movement in both China and the USA/Aus. If we want to stop the wars around the world or any conflict between ANZUS and China in the Pacific then we must understand that these alliances and wars are for profit. There is no benefit for working people in military alliances of any kind as the old saying goes: It’s the rich who start wars and the poor who die in them.